This German StuG III Ausf. G Assault Gun replica 211 called 'Hedwig' was owned by Harold Mariller, an expert on the subject of German Armour. It used to be seen at military vehicle events in the summer in Britain like the annual War and Peace Show in Folkestone. It can now be seen by visitors to the Jersey War Tunnels Museum as it is parked by the Tunnel entrance. Heinrich Heimann and his team built the 'Hedwig' in England. The upper hull was built on top of a British cold war era FV432 armoured personnel carrier chassis. After the harshest Russian winter 50 years the German StuG III Assualt Gun crews had survived Russian counter-attacks and the freezing living conditions to be ready for a new offensive. In 1942, organisation German Assault Battalions was changed. With the arrival of more Sturmgeschütz III assault guns from Germany by train the amount of vehicles assigned to each battalions three batteries rose from 6 to 9. Each battery was then subdivided into three sections of three StuG III assault guns. 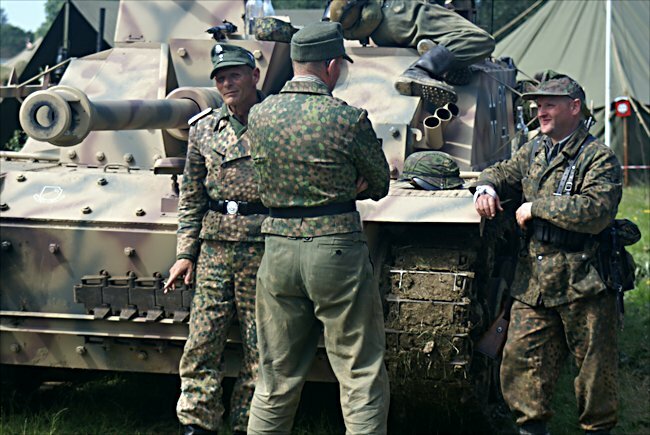 Each Battalion now had 27 StuG IIIs and was much more powerful than a year before. A command StuG III was soon added to each battery to increase the Battalion the strength up to 30. Because of the experiences in 1941 against the T 34 and KV-1 Russian tanks armour of new StuG III assault guns arriving on the Eastern front had been increased. It was not until March 1942 that the StuG III assault gun Ausf F arrived on the battlefield with its longer high velocity 75mm Sturm cannon 40 that had more penetrating power and the earlier shorter low velocity 75mm gun. With the onset of the second Russian winter, the Germans were much more prepared. The troops had better winter clothing and armoured tracked vehicles like the StuG III were issued with special clip on track extenders. The wider tracks enabled vehicles to plough through thick snow much more easily. 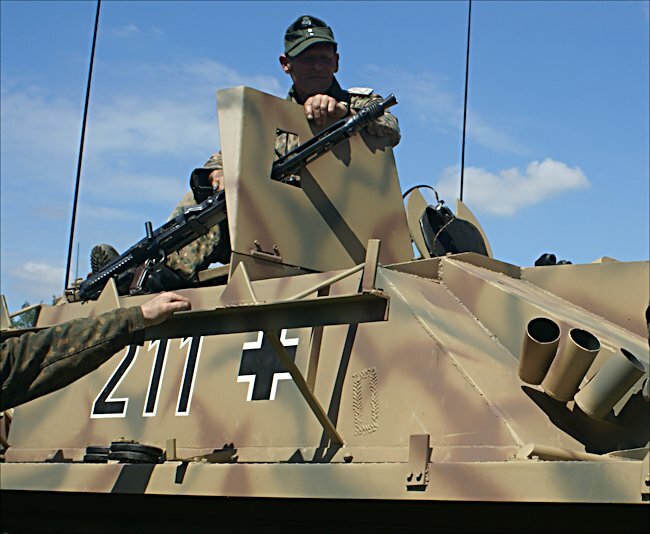 December 1942 saw the last production run of the StuG III assault guns. Commander's hatch received a cupola and the machine gunner now had a shield. Just like this replica. 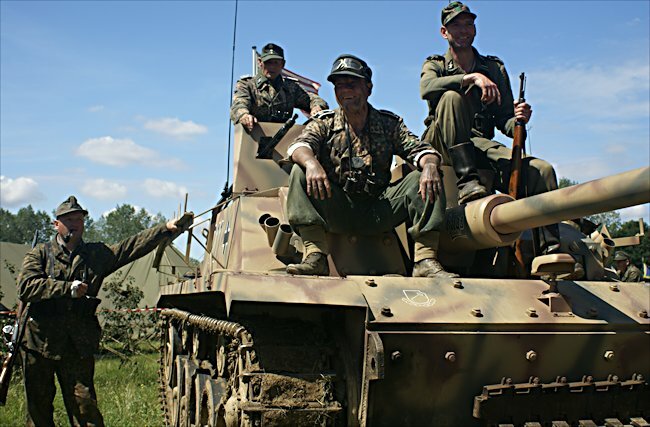 German infantry were often seen in news reel footage riding on the top of StuG IIIs going into battle. German tank crew member Lugwig Bauer had already escaped from lost two burning tanks on the Russian Eastern Front. In 1941 his Panzer II tank had been hit by a KV-1 as his unit attacked the city of Tula. In the Spring of 1942 his Panzer Mark III was rammed three times by a KV-1 before it managed to send a shell through the Panzer’s engine. Each time he was wounded. On 16th December 1944 he was part of the newly formed German 6th Army that attacked the Americans in the Ardennes as part of a surprise mid-winter attack that would become known as the Battle of the Bulge. He was now part of a tank destroyer unit equipped with the StuG III. The advance began to grind to a halt as the Allies began to fight back. Some of the M4 Sherman tanks that were sent to the area had been upgraded with better frontal armour and gun. Instead of the normal 50mm of armour the new M4A3 ‘easy eight’ had 63mm of frontal armour. It had a 76mm long barrelled gun rather than the 75mm short barrelled gun. 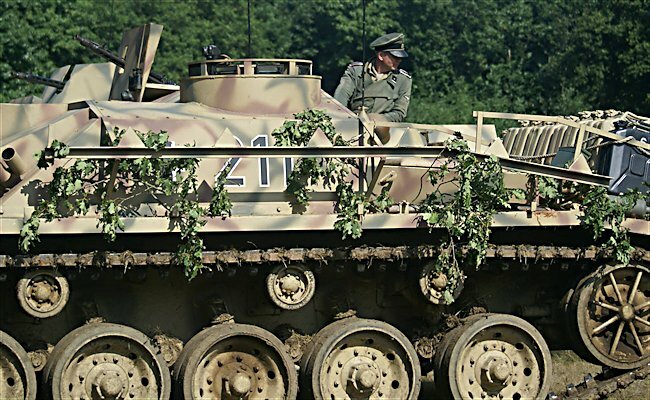 German StuG III Assault Gun replica 211. You can tell it is a replica by looking at its wheels. There should be six small wheels like on the Panzer III tank. "We saw the Shermans coming down the hill. They started attacking us. We were able to attack them in a classic tank battle. The Germans use a so called ‘Mission’ type tactics. The American Army use the ‘order’ type tactics. The difference for me was substantial. The ‘order’ type tactics that the Americans used did not leave any choice for the tank commander. While the unit commander is being told what to attack he is also being told how to do this. The German unit commander was able to decide for himself. This German tank tactic helped us achieve all our great results." "We flanked them left and right. We turned and was able to engage the side armour of these tanks at 800 metres. That is what we did. We picked them off. In front of us on this hill there were many American tanks that had been hit and were burning."